Eppendorf Dualfilter Tips Technical Report can be downloaded in PDF format here. The use of various filter tips for preparation of PCR experiments can lead to significant decreases in the efficiency of DNA amplification. With a minimal effect on PCR reactions, ep Dualfilter T.I.P.S. are particularly well suited for preparing PCR experiments; this is evident with both classic PCR and real-time PCR. The polymerase chain reaction is a common application in molecular biology research. Various filter tips are well suited for the preparation of these types of experiments. However, it cannot be excluded that the filter material may come into contact with the PCR sample, which can negatively affect the efficiency of classic PCR and quantitative real-time PCR. Filter tips are vitally important for preventing contamination during PCR experiments and other molecular biology applications such as bacteriology and work in radioactive areas. Primarily, they prevent the sample solution from contaminating the pipette cone during aspiration. They also prevent that contaminated aerosols from the pipette cone come into contact with, for example, a PCR sample if a contaminated pipette is used. 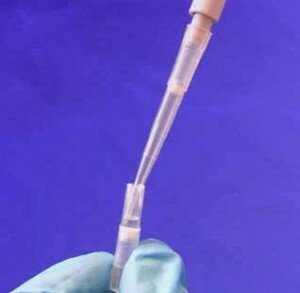 Due to filter contact, general adhesive effects can cause specific sample agents to bind to the filter material, which means that these agents will no longer be available for the DNA amplification process. Moreover, many filter tips contain self-sealing additives. These substances, which contain cellulose rubber, swell and close up when they come into contact with liquids. This causes sample loss because the sample material is encased in the filter and cannot be recovered. Furthermore, some self-sealing additives may dissolve when they come into contact with an aqueous phase, thus contaminating the sample. These factors are another source of potential losses in efficiency which can occur during a PCR experiment. Non-self-sealing filter tips, such as the Eppendorf ep Dualfilter T.I.P.S., contain a pure PE filter. If improper pipetting and subsequent filter contamination occurs, the sample material is not aspirated and is therefore retained. Moreover, contamination due to self-sealing additives is impossible. Here, it was investigated how the efficiency of classic and real-time PCR is affected by possible contamination due to the use of various filter tips. The inhibition of classic PCR and real-time PCR using ep Dualfilter T.I.P.S. and various other filter tips was tested. The examination of the inhibition of classic PCR was carried out after the PCR sample came into contact with pipette tip filters under defined incubation conditions. A sterile needle was used to push the filters out of the tips into a 1.5 mL tube. 99 μL PCR mix (without dNTPs) were added to each filter and the samples were incubated in an Eppendorf Thermomixer (500 rpm, 1 min). 3 tips were investigated per supplier. The dNTPs (0.1 mM final concentration) were added after the incubation. The PCR was then carried out using a Mastercycler pro (Eppendorf) with 20 μL as sample volume. Primer reverse: 5’ GGTTGGCCAATCTACTCCCAG 3’. 5 μL of the samples were electrophoretically separated in a 2.5 % agarose gel/1 x TBE. The gels were stained in an EtBr solution containing 50 μL 1.5 % EtBr in 1 L water. inserted into the filter tips from below to cover the filters (Fig.1). After incubation in an Eppendorf Thermomixer (500 rpm, 1 min), the PCR samples were carefully resuspended, then removed from the filter and transferred to a 1.5 mL tube. 5 tips were examined per supplier; two technical replicates were inspected for each tip. A melting curve was then created by heating from 60 ºC to 95 ºC over 10 min. The incubation of the filter from manufacturers B and A in the PCR reaction mix leads to a nearly complete inhibition of the subsequently completed PCR. In a following gel electrophoresis DNA bands could not be detected. In contrast, no significant inhibitory effect was detected with the use of ep Dualfilter T.I.P.S. (E) (Fig. 2). No PCR could be completed with a different filter used in the experiment (manufacturer G) because the entire PCR sample was aspirated by the filter during the incubation. The influences of all filter tips on the results of DNA amplification were determined using real-time PCR, a highly sensitive quantitative method. The average Cq values of all samples deviate from the positive control (PC) values. However, the extent of the deviation varies significantly according to the filter tip used (Fig. 3). The upward shift of the Cq value was at its lowest when ep Dualfilter T.I.P.S were used. 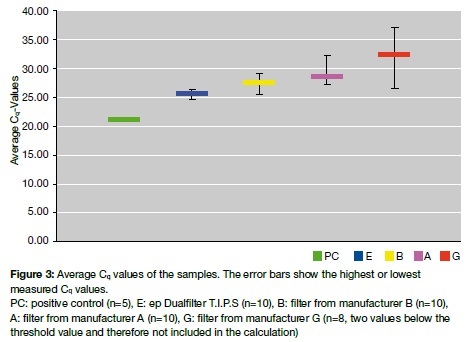 The highest Cq value was measured with the samples incubated on filter G. The largest difference between the highest and lowest measured Cq value was observed with this sample (as depicted in the error bar in Fig. 3). 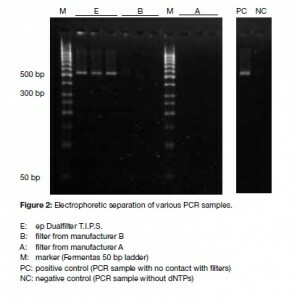 The detailed real-time PCR results are shown in Figure 4, which illustrates the positive controls (green), negative controls (black) and the samples used with ep Dualfilter T.I.P.S. (blue) and filter tips of manufacturer G (red). The difference among the Cq values of the tested replicates increases in tandem with the increasing inhibitory effect of the filters. When using ep Dualfilter T.I.P.S. (E), the deviations among the replicates are very low and also their gradients in the amplification plot do not differ significantly from those of the positive controls. When other filter tips are tested both gradients and deviations differ particularly to a significant extent from those of the positive controls. The results show that inhibitory effects caused by PCR samples coming into contact with various filter materials lead to the full suppression of DNA amplification in many cases (Fig. 2, samples B or A). Figure 2 illustrates that ep Dualfilter T.I.P.S. are particularly well suited for conducting PCR experiments because no significant influence on the PCR reaction was observed even if the PCR mix came into contact with the filter (Fig. 2, sample E). With regard to real-time PCR, the goal is to prove that any filter contact decreases the efficiency of DNA amplification, which leads to an increase in the Cq value compared to the positive control. However, the scale of the negative effect on the reaction is highly dependent on the type of filter. In the test, the ep Dualfilter T.I.P.S. exhibited the smallest influence on real-time PCR, whereas filter G, for example, had a significant effect on the PCR efficiency (Figure 3). For the real-time PCR a more robust system was selected as for the classic PCR in order to investigate quantitative differences among the inhibitory effects of various filter tips. The DNA concentration used was significantly higher than the concentration of the PCR samples used for the classic PCR experiments. Therefore, the inhibition in this experiment did not turn out to be as extreme as with the classic PCR, for which DNA amplification was almost completely avoided due to the inhibition of filters from manufacturers B and A. Moreover, with real-time PCR, the contact surface between the PCR sample and filter was significantly lower during the incubation because the sample was directly inserted into the tip from below, and the entire filter was not incubated in the sample. Therefore, the inhibitory effects may be weaker with real-time PCR than with classic PCR. Figure 3 shows that, as the inhibitory effect of the filter increases (higher Cq values), deviations among the replicates also markedly increase, thus limiting the reproducibility of PCR experiments. The reason for this may be the non-uniform inhibitory effects of the filters. Furthermore, the possibility that the PCR samples were not contaminated with inhibitory agents to the exact same degree cannot be ruled out, because, for example, the resuspending processes of the PCR samples on the filter may slightly deviate. The differences are very low when ep Dualfilter T.I.P.S. are used, which is directly correlated to a low inhibitory effect. Because of the above mentioned reasons, the deviations increased significantly when thefilter from manufacturer G was tested. In conclusion, it was established that all filters have a certain inhibitory effect on PCR after coming into contact with the PCR sample, either due to general adhesive effects or because of the self-sealing adhesives in the filter. These inhibitory effects vary considerably from filter to filter. ep Dualfilter T.I.P.S. are especially well suited for preparing PCR applications because they exhibit a very low effect on PCR compared to other filter tips.